Not sure what's going on. I've played with the firmware a little and have them moving in the right direction, but they are stopping before they hit the endstop. 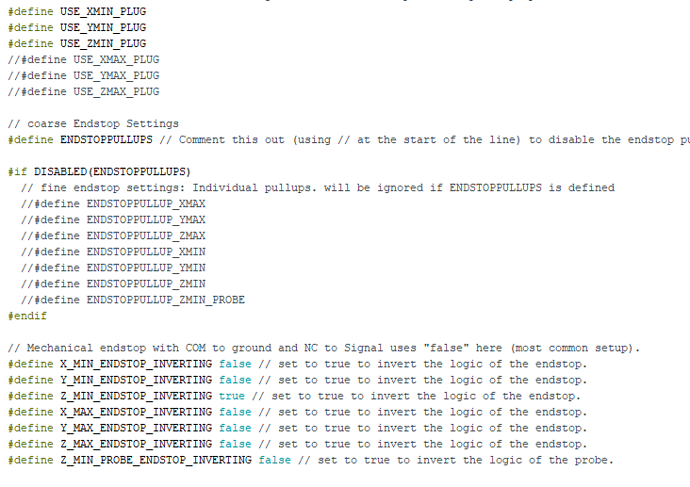 Edit: I'm setting X_MIN_ENDSTOP_INVERTING, and Y_MIN_ENDSTOP_INVERTING to false. See if it helps..
And on a sidenote my x steppers are quite noisy, I've checked their voltage and it's at 1.14ish, and it won't go Amy higher. I have the pot turned all the way to the right. Is it a stepper problem? Edit: so I've set y min and Max inverting to false, and it seems to work okay, but now it stops before it hits the endstop. I've set the x min and Max inverting to false aswell but it stops before the endstop most times too... They act like they've hit the endstop but factually haven't. "False endstop triggering"
I had the same problem. I tried to home it using g28 and it would stop almost instantly. The Z axis homed completely fine it was just the x and y axis that were failing. What I did was I put a 100nf capacitor on each switch and after that it started working great. Where did you solder on the capacitor and to what leads from the switch? Thanks!